I started to prepare a post about the Bosman branch of the Remine (Remijnse) family, but then one character in the drama led to another, and I realized I need to do more work on it before I can post. So instead I offer you a photo from a collection I have not yet shared. It’s from a photo album owned by Alice Leeuwenhoek Moerdyk. She has a lot of photos of the good time the family used to have at Brook Lodge, outside of Kalamazoo. 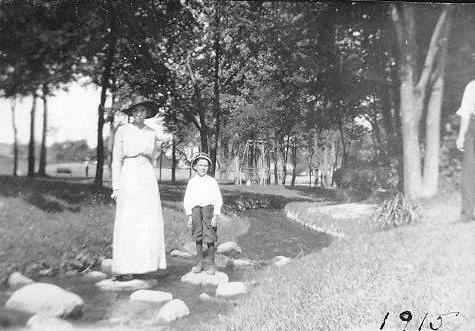 In this photo, taken at Brook Lodge, the boy is most likely my grandfather. The date is 1915, and my grandfather was born in 1908. This photo was taken in the summer, and Grandpa’s birthday was October 31. The boy looks to be about six, and the facial resemblance is there. Brook Lodge was a 40 acre farm that was purchased in 1895 by Dr. W.E. Upjohn, founder of the Upjohn Company. He converted the old creamery to a summer cottage for his family. Grandpa told me that the family was invited often to relax at Brook Lodge. This photo was taken two years after Dr. Upjohn married the widow of James F. Gilmore, a founder of the Gilmore Brothers Department Store. People from the area will recognize both the names Upjohn and Gilmore. Update: My uncle believes that the woman in the photo is Alice who would have been about 18 at the time of this photo. I think the woman is Alice! Uncle Don, I thought of another clue that verifies this: that hat is something Alice would have worn!! Thanks, Deborah! I love it, too! Great photo! I love her posture – she seems to have a certain something about her. Alice had an eye to fashion and, as the only child of a shopkeeper, she was fairly spoiled, according to my grandfather. Now he was also the only child of a shopkeeper, but they had health problems which affected their family finances, etc. What a fun picture of them standing on the rocks in the creek! Brook Lodge looks like it must have been a really fun place to visit. Sheryl, I think so, too! I believe that is Augusta Creek, which branches off from the Kalamazoo River. I love the stories these old family photos tell. It doesn’t matter whether you know the people or not–you can still enjoy the stories and people behind the picture. What a lovely photo! Someone seems to be entering the frame on the one side, above the date. And how great that you have the date, right there on the picture. What a beautiful dress and hat!